[2013.07.27]大毒枭罗兴汉 - 人物 - ECO中文网 - Powered by Discuz! MEN in his line of work rarely reach old age. They die in a hail of bullets from police sharpshooters or a rival gang, and are buried fast in shallow jungle graves. Not Lo Hsing Han. 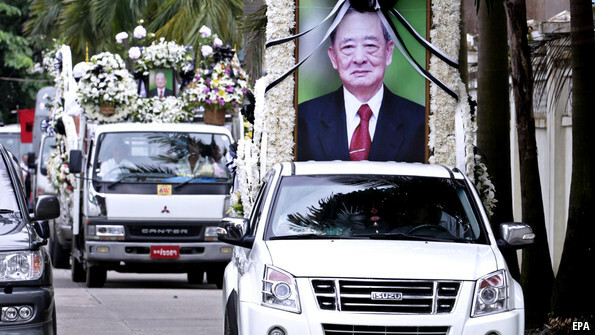 At his funeral a cavalcade of cars, some carrying his portrait garlanded with flowers, processed through the streets of Yangon, Myanmar’s capital, to his high-walled villa, right by the 16th tee of the city golf club. Crowds of villagers attended from his native region, in the Golden Triangle of Myanmar’s north-east. They rubbed shoulders with former generals, two cabinet ministers and the cream of Yangon society. Mr Lo was a respected businessman. He was also a pillar of the economy. Wherever you looked in Myanmar, he and the sprawling Asia World conglomerate he had founded were involved in some project, often with Chinese partners. The deep-water port at Kyaukpyu; a $33m highway from Arakan state to the Chinese border; an oil and gas pipeline; the Traders luxury hotel. He ran the main bus company, and was building the Myitsone dam. Though he seldom appeared, and seldom spoke when he did, he could throw a party: in 2006 he organised the wedding of the daughter of the then leader of Myanmar’s junta, in which guests appeared draped in diamonds and drunk on cascades of champagne. His wealth was so vast, by repute, that no one could guess it. Small wonder, when exports of his main product equalled in 1998 all Myanmar’s legitimate exports put together. His success came from making a product superior to other people’s: in his case, No. 4 grade China white. 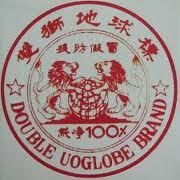 It was marketed in plastic bags with the brand-name “Double UO Globe” and the words “100% pure” in Chinese characters. And pure it was, unlike the dirty brown variety from Afghanistan. It could be injected, not merely smoked, and the effects were longer-lasting. He oversaw every stage in heroin-making, from paying farmers who grew poppies on the hilly plots of the Triangle to the transport of raw gum, in huge sacks, on the backs of hundreds of mules treading narrow jungle paths to the markets and refineries on the border with Thailand, to shipment overseas. It was Mr Lo who, in the 1960s and 1970s, shipped to Vietnam the heroin that ravaged 10% of America’s forces. Not that he turned a hair. There was a saying among the ethnic Chinese in Shan state, like him: commerce was commerce. He had not traded opium from the start, though. Born poor in Kokang district, he had toyed around with video parlours and liquor stores. He had also become a troop commander for the local prince. When the Burmese army threw out all the princes, he changed sides, and in the anarchy of Shan state in the 1960s he became captain of a militia of 3,000 men. His job now was to fight both Shan nationalist and communist guerrillas, funding himself with Yangon’s full permission by taxing the opium convoys. (In the mountains, opium was the only currency.) Soon his soldiers, in proper uniforms and with AK47s, protected most of the trade. Once deep in, exchanging his sacks in Thailand for gold bars and fancy furniture, he never looked back. Once more the junta thought it could make use of him. He was resourceful, and seemed to know everyone in the ethnic chaos of Shan state. After 1989 the generals let him carry goods to the Thai border unimpeded if he acted as an emissary to the Shan, Wa and Kokang rebel armies. Soon enough, peace deals emerged. He was very useful, said the intelligence chiefs. He had also become a troop commander for the local prince. It was Mr Lo who, in the 1960s and 1970s, shipped to Vietnam the heroin that ravaged 10% of America’s forces. he had toyed around with video parlours and liquor stores. After 1989 the generals let him carry goods to the Thai border unimpeded if he acted as an emissary to the Shan, Wa and Kokang rebel armies. Soon enough, peace deals emerged. Mr Lo was allowed to repatriate the funds he had stowed offshore. I toyed with the idea of moving to France but ended up staying here. She toyed [=played] with her hair while she talked on the phone. Do you really love me, or are you just toying with me? This was water off a duck’s back. GMT+8, 2019-4-21 04:27 , Processed in 0.148758 second(s), 29 queries .